This chapter examines Sorensen’s influence over the development and delivery of President Kennedy’s domestic agenda. It explores the President’s mixed legislative record. The chapter also examines the origins of the 1962 steel crisis and the methods that President Kennedy used to resolve it, showing how he employed his most trusted advisors, including Theodore Sorensen and Robert Kennedy, in shaping the administration’s strategy. 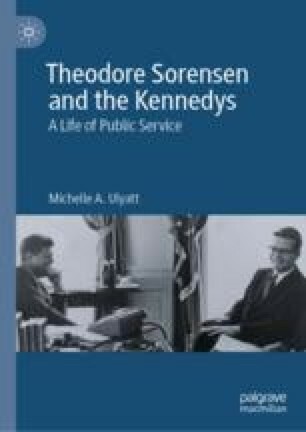 Ulyatt assesses President Kennedy’s reluctance to engage with the civil rights issue early in his presidency and explores Sorensen’s growing role in the administration’s handling of the matter when events forced the President’s hand after 1962. The chapter charts Sorensen’s involvement in drafting Kennedy’s civil rights address to the nation and in creating the legislation that became the 1964 Civil Rights Act. Bundy, McGeorge. 1964. Interview by Richard Neustadt. John F. Kennedy Presidential Library and Museum, March 1964. https://docs.google.com/viewerng/viewer?url=https://archive2.jfklibrary.org/JFKOH/Bundy,+McGeorge/JFKOH-MGB-01/JFKOH-MGB-01-TR.pdf. ———. 1963. “Report to the American People on Civil Rights, June 11, 1963.” John F. Kennedy Presidential Library and Museum. https://www.jfklibrary.org/Asset-Viewer/LH8F_0Mzv0e6Ro1yEm74Ng.aspx. McNamara, Robert S. 2008. “An Evening with Ted Sorensen, May 28, 2008.” John F. Kennedy Library Forums. https://www.jfklibrary.org/Events-and-Awards/Forums.aspx?f=2008. O’Brien, Lawrence. 1985. Interview by Michael L. Gillette. Lyndon B. Johnson Presidential Library Oral Histories, December 5, 1985. http://www.lbjlibrary.net/assets/documents/archives/oral_histories/obrien_l/OBRIEN05.PDF.